Hilarious things are bound to happen when people not knowing each other’s language communicate in gestures, signposts, and Pictionary. Recently, a Chinese nurse made headlines for giving instructions to a hospitalized international student in a funny but spooky way. How this medical professional went out of the way to give her patient necessary guidelines, is beyond awesome. What Was So Funny in Chinese Nurse’s Way of Giving Instruction? Earlier a 73 years old Chinese pole dancer had amazed with her skills and now comes this note by Chinese nurse, giving a perfect dose of laughter. As evident from the note; the nurse tried to tell the patient that at 8:00 AM tomorrow morning he had a surgery, hence he should not eat or drink anything after 10:00 PM. As she didn’t know English, she drew this message on a note that looked funny as well as a bit horrific (because of that knife with a drop of blood underneath. The note was reportedly brought to the attention of the internet world by a Reddit user WaspDog. And, it instantly went viral on social media. Well, the communication style was the perfect content for social media entertainment but it also threw light on some different aspects of Chinese history, culture and professionalism of the people there. This won the hearts for Chinese girls overall. where's the nurse ? RT @millzero Personal Note : I just don't know why i like Chinese girls. They always look cute and beautiful. Do We Really Need to Understand English? This note makes it imperative that there is no such need of learning English because symbolism is the best lingua franca. Further, a determination has to be a key to accomplishing one’s job, as it is enough pre-requisite of finding the ways of getting things done. First, you need to know English. Kalau tak paham ingerris, memanglah tak paham message ni. This chinese nurse nailed communications! First class! The case also proves that the case for a common denominator of humanity, where people are able to understand each other despite difference on the basis of race, ethnicity and language they speak. At the same times, use of symbolism to convey messages also requires a degree of precision. 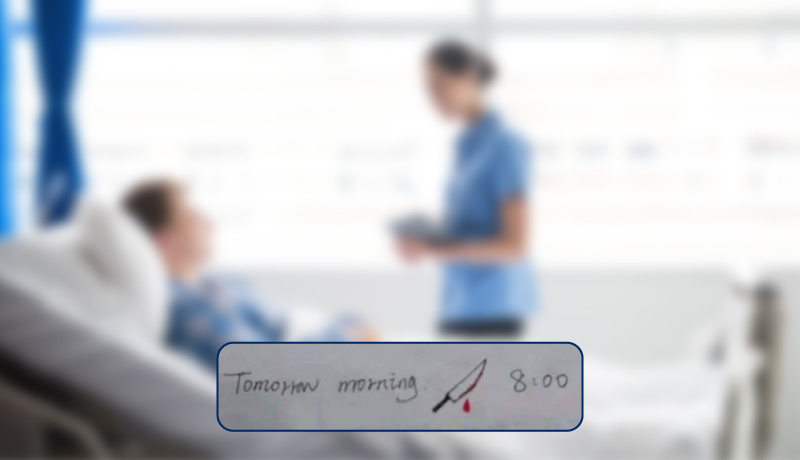 After all, a blood dripping knife can have several other meanings apart from merely representing a schedule surgery. Luckily, this genius chinese nurse had beautifully mentioned the context; otherwise that knife symbol was enough to land someone in hospital, despite a sound health. Thankfully, the nurse has nailed the communication through symbolism. No wonders, why her note is going this viral on social media.